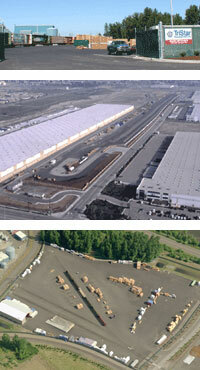 (Map) Our Vancouver facility is located in the Port of Vancouver and is minutes from Interstate-5. It features a rail spur serviced by BNSF, 12,000 square-foot indoor storage building, loading ramp for container and boxcar loading, and a 13-acre outdoor storage yard. The Vancouver facility is equipped to handle containers, long-haul trucks, port drayage, centerbeam flatcars, bulkhead flatcars, boxcars, and gondolas. This facility has 3 tracks with 22 railcar spots. (Map) Our Fontana facility is conveniently located near the intersection of Interstate-15 and Interstate-10. It features a rail spur serviced by BNSF, a loading dock for container and boxcar loading, and a 38-acre paved and unpaved outdoor storage yard. The facility is equipped to handle containers, trucks, centerbeam flatcars, bulkhead flatcars, boxcars, and gondolas. The facility has 6 tracks with 40 railcar spots.